Heat oven to 400°F. Spray 9-inch pie plate with cooking spray. 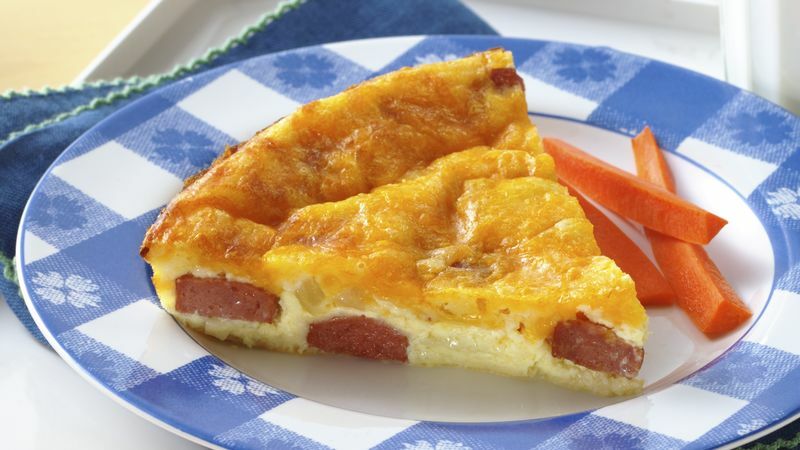 Layer hot dog pieces and onion in pie plate. In medium bowl, stir Bisquick mix, milk and eggs with wire whisk or fork until blended. Pour into pie plate. Sprinkle with cheese. Bake 25 to 30 minutes or until knife inserted in center comes out clean. Let stand 5 minutes before serving. Serve with ketchup and mustard. Use reduced-fat hot dogs, Bisquick Hear Smart® mix, fat-free (skim) milk and shredded reduced-fat Cheddar cheese. Substitute 3 egg whites or 1/2 cup fat-free egg product for the eggs.